This is the perfect cake for the ultimate birthday celebration. Gourmet dessert lovers will adore the amazing blend of yellow cake, vanilla whipped filling and sweet vanilla bean frosting. This two-layered cake is topped with decorative rainbow confetti sprinkles on top and all around the sides! Includes a festive chocolate Happy Birthday plaque and arrives in an elegant gift box. 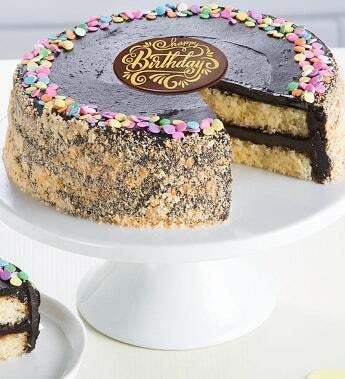 7” Golden Fudge Birthday Cake, net wt. 1.75 lbs.